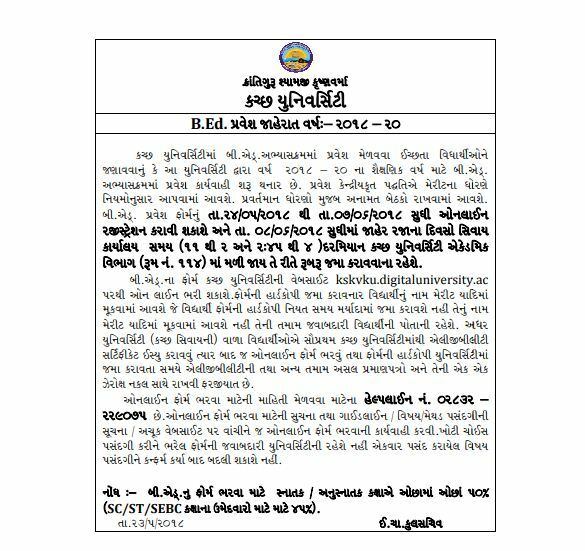 The Kachchh University released admission notification for UG-PG various faculties, B.Ed admission, UG-PG Semester admission for academic year 2018-19. 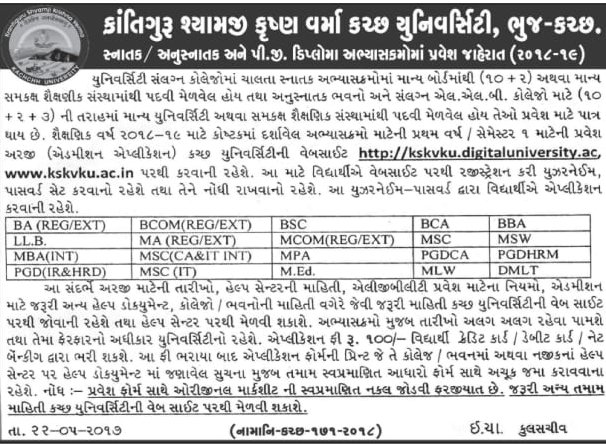 Eligible and aspirants students may apply for KSKVKU Admission on its official website. The Krantiguru Shyamji Krishna Verma Kachchh University released notification regarding BA, B.Com, MA, M.Com – UG/PG courses admission for academic year 2018/19. Candidates posses qualification they may apply online for various courses. KSKVKU Conduct Examination Every year. Kachchh University Offered Diploma Courses, Degree Courses, Master Courses, Ph.d and M.Phil for Students. Students have to go on official website www.kskvku.ac.in. Click on the degree in which candidate want apply. Fill necessary information and registered it. Login with Registration Number select course. Select college and and submit form. 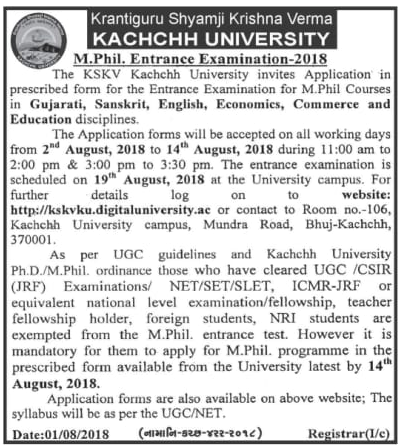 The Krantiguru Shyamji Krishna Verma Kachchh University invites application form for the entrance examination for M.Phil Admission 2018 in Gujarati, Sanskrit, English, Economics, Commerce and Education faculties. Students who are looking for KSKVKU M.Phil admission they may apply through online mode application on its official website. Online application start from 2nd August, 2018 to 14th August, 2018. The Entrance examination will be held on 19th August, 2018 at University campus. Candidate have to clear master degree with at least 55% (in case of SC/ST-50%) in the concerned subject from this university or any other university recognize by the UGC. However the students appearing in semester-4 or part-2 exam of the concerned Master Degree may also fill the form. The students who have cleared UGC /CSIR (JRF) Examinations/ NET/SET/SLET, ICMR-JRF or equivalent national level examination/fellowship, teacher fellowship holder, foreign students, NRI students are exempted from the Ph.D. entrance test. However it is mandatory for them to apply for Ph.D. program in the prescribed form available from the University latest by 14th August, 2018. Applicant posses essential qualification they may apply for KSKVKU Admission on its official website. Candidate should have to check all information like last date for apply, eligibility criteria, help centers information, necessary documents for admission and other information on official website www.kskvku.ac.in or kskvku.digitaluniversity.ac. Applicants should have cleared Graduate-Post Graduate degree (Science/Social Science/Humanities/Commerce) with the minimum 50% marks (For SC, ST, SEBC students 45% marks) from any recognize university approved by UGC. The merit list of the candidates who have apply for admission in the manner prescribe by the Admission Committee, within the prescribe time limit. Applicants may read full merit calculation pattern in official booklet. If Students have any Queries Leave Comment on Comments Box, We Will Try Assist u Best As Our Knowledge.